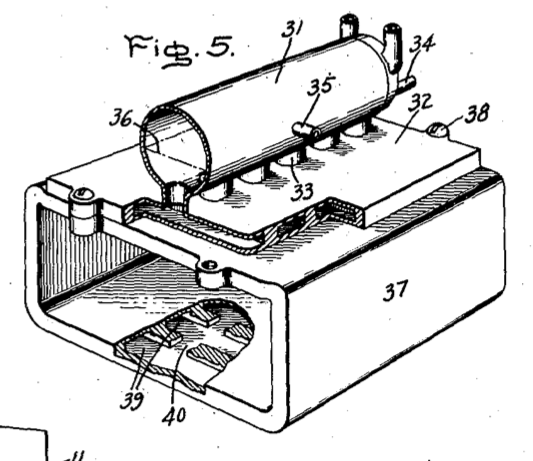 This curious little gem here is a modular refrigerator evaporator from a US patent granted 1935. Available here. The purpose of the invention being that it allows for the removal or replacement of a refrigerator’s evaporator coil (or at least part of it), without opening the refrigerator’s vapor compression system, risking a leak, air or water contamination. Of particular concern at this time in history was the damage a refrigerator owner could do to the cooling coils when defrosting them by puncturing the coil with a scraper or ice pick. These early refrigerators were designed with the evaporator coil in a shape to receive ice trays for freezing. Extended use could leave wear to any enamel finish, so a replaceable evaporator coil could be an advantage. Also, adding or removing secondary evaporators allows one to change the system capacity. This modularity was designed for the flooded type evaporator which was not uncommon in the late 1920s and early 1930s. More information on flooded evaporators here and here and some old machines here. The volume of the coil was literally “flooded” with low pressure liquid refrigerant and the suction pressure was determined by the volumetric efficiency, displacement and speed of the compressor as well as the properties of the refrigerant, boiling temperature and pressure, and refrigerator load and surface area of the evaporator itself. The beauty of these systems was that they barely superheated the refrigerant and couldn’t return liquid refrigerant to the compressor if employed well. 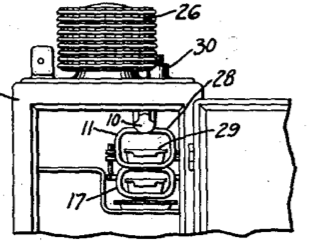 The level of refrigerant within the evaporating chamber was maintained by either a float valve within the chamber or a float valve in the high side of the system as is likely in the depiction on the right. 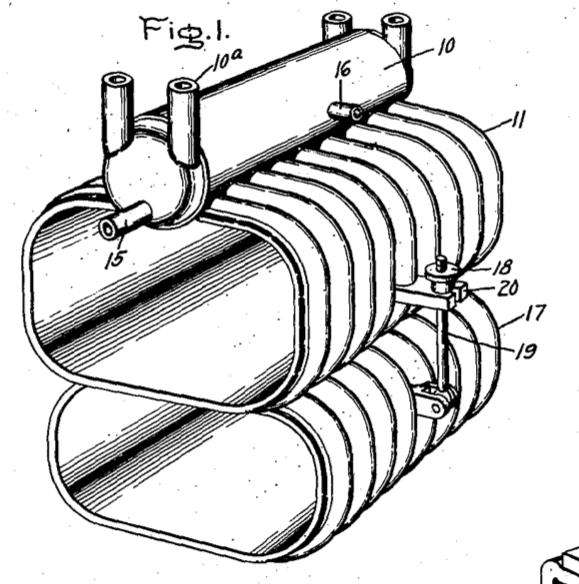 The early forms of these evaporators were a horizontal copper or steel cylinder with small tube loops extending out and downward in order to increase surface area. Later, thin aluminum sheets were stamped with grooves and welded together to form a fluted channel and then bonded to the cylinder supplying refrigerant. That is the construction seen in these diagrams. The secondary evaporator is built similar to the primary, working evaporator except it does not share a common supply of refrigerant. The secondary is sealed with refrigerant inside, filled part of the way up. When it is firmly in good thermal contact with the primary evaporator coil, heat absorbed by the refrigerant in the secondary would boil, forming a vapor that once in contact with the inside top surface would be cooled to condensation by the boiling of the refrigerant in the primary evaporator where the vapors were then drawn back through the suction line to the compressor. This secondary represents a form of a heat pipe. Pretty cool huh? 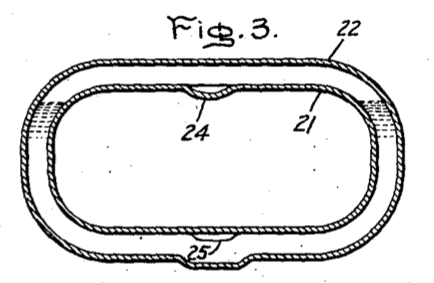 According to the inventor, this concept can be realized in forms other than the stamped metal seen above, but could also the of the cast type. In the diagram to the right, the majority of the cooling unit is removable with the loosening of a few bolts. I don’t know if any refrigerators employing this modular technology were ever put into production.